Hydroponics indoor growing tent with heavy-duty zippers and double stitching for light protection ensure durability and long-lasting use. Thick tent material reinforced by the metal poles ensures security and stability. Keep your grows contained, prevent odors from leaking out, and stop pests from getting in. Includes a removable Mylar floor tray, and a 100% light-proof, tear-proof reflective Mylar lining to assist your indoor growing light fixtures and equipment. 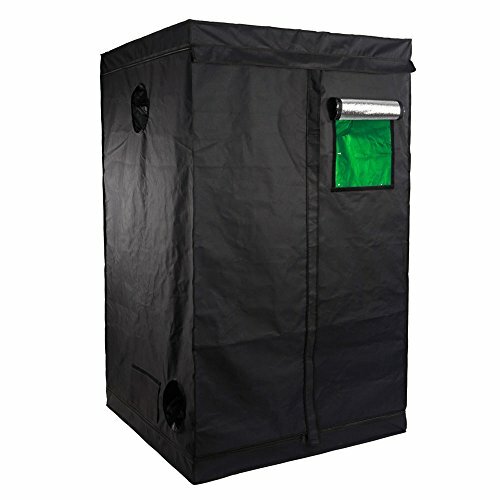 Increase the intensity of your grow lights and retain heat to keep your grow room at the right temperature for your plants, herbs, flowers, fruits, and vegetables to thrive.Effectively resisting any intense sunlight from shining on the plants, this tent could help to extend the lifespan of plants,Also, quite room-saving and lightweight,it is worthy of purchasing! This is a great hydroponics growing light kit system starter, whether you want to set up your indoor garden in an apartment, condominium, greenhouse, or any rented space. Easy assembly.